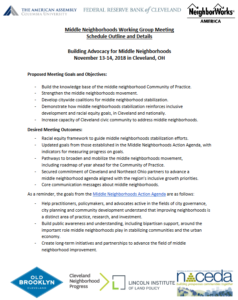 “Building Advocacy for Middle Neighborhoods” was an invitation-only working group meeting. The agenda featured new research as well as new tactics to mobilize support nationally. Designed to accommodate a robust response to an open call for session proposals, the agenda also prioritized peer sharing and training opportunities as well as spontaneous self-organized workshops on topics of mutual interest. A major focus of the meeting was on identifying pathways to broaden and deepen the middle neighborhoods movement. Also important was demonstrating how middle neighborhoods stabilization can reinforce inclusive development and racial equity, in Cleveland and nationally. Below is an outline of events. Click to view a detailed schedule PDF, which includes full descriptions of plenary and breakout sessions, as well as goals and anticipated outcomes for the meeting. Partners for the Cleveland working group meeting include The American Assembly, The Federal Reserve Bank of Cleveland, NeighborWorks America, Cleveland Neighborhood Progress, Old Brooklyn Community Development Corporation with support from Lincoln Institute of Land Policy, the National Alliance of Community Economic Development Associations, and Cleveland State University’s Maxine Goodman Levin College of Urban Affairs. Sponsors for the panel discussion and reception on Nov. 13 include the George Gund Foundation, Cleveland Foundation, and Third Federal Savings & Loans. If you have questions about the working group meeting, contact Stephanie Sung at ss4336@columbia.edu. To join the middle neighborhoods mailing list, email Mark Leneker at ml2307@columbia.edu.